Meet the LanBoy Air. Nearly every part on this case, even the motherboard and PSU mounts, is modular and customizable. Up to 15 exhaust fans create positive air pressure inside the case that blows dust and heat out through panel perforations. Up front, the LanBoy Air's AirMounts™ HDD mounting system literally suspends drives in mid-air for unsurpassable vibration and noise resistance. Along with its two internal 2.5" SSD bays and a front-panel USB 3.0 port, the LanBoy Air is the last word in high-flexibility PC case design. What highlights the LanBoy Air is its modular design allowing highly customizable installation. Nearly every panel, including the motherboard tray and the power supply cage, can be removed and relocated to suit your needs. Open-frame Mesh Panel Construction The open-frame mesh panel construction keeps cool air in, dust and heat out for superior cooling performance while preventing dust accumulation. 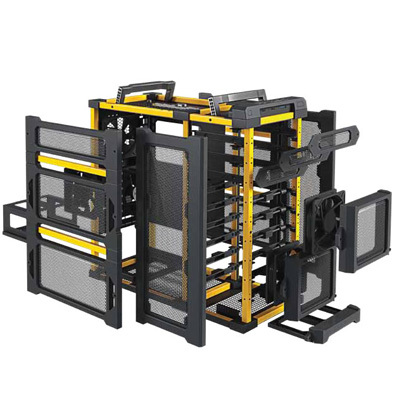 Supreme Expandability plus AirMount HDD Suspension Mount System The Antec LanBoy Air boasts 6 x 3.5’’ drive bays, 3 x external 5.25" HDDs and 2 x internal bottom-mounted 2.5" SSD bay, together with 8 x expansion slots for triple graphics-card configurations. Exclusive AirMounts HDD suspension mount system kills vibration, reduces noise and is mountable in 3 directions (supports up to 6 HDDs). Water Cooling Ready The Antec LanBoy Air is ready for a water cooling system, with top water cooling radiator fitting and rear water cooling grommets. Convenient Front I/O Panel with USB 3.0 Port The convenient front I/O panel offers easy access to one USB 3.0 and two USB 2.0 ports, audio in and out ports (AC’97 and HDA compatible).